Francisco Lemos, from "The Price of our Heritage,"
an account of the 42nd Division in World War I. One hundred years ago today, on September 15, 1918, Francisco Lemos died in France, giving his life for his country. He was only 30 years old. 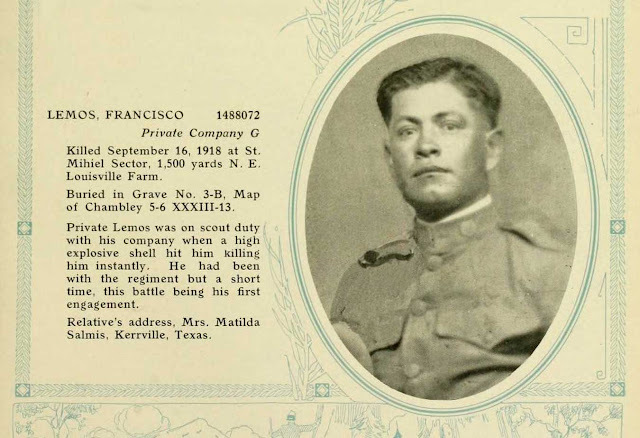 Private Francisco Lemos was on scout duty with Company G, of the 168th Infantry, 42nd Division, in the Saint-Mihiel Sector, about 1,500 yards northeast of the Louisville Farm, when a German high explosive shell killed him instantly. 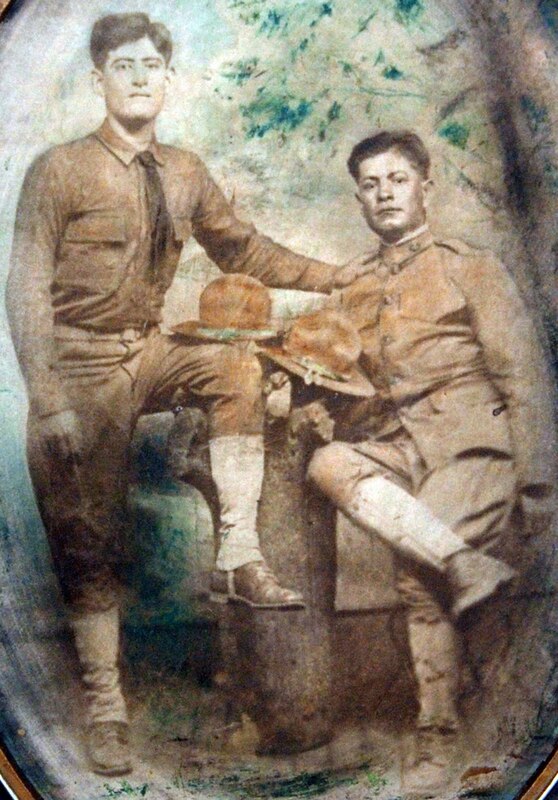 The same shell injured another soldier from Kerrville, his friend Emmett Rodriguez, who survived the explosion. 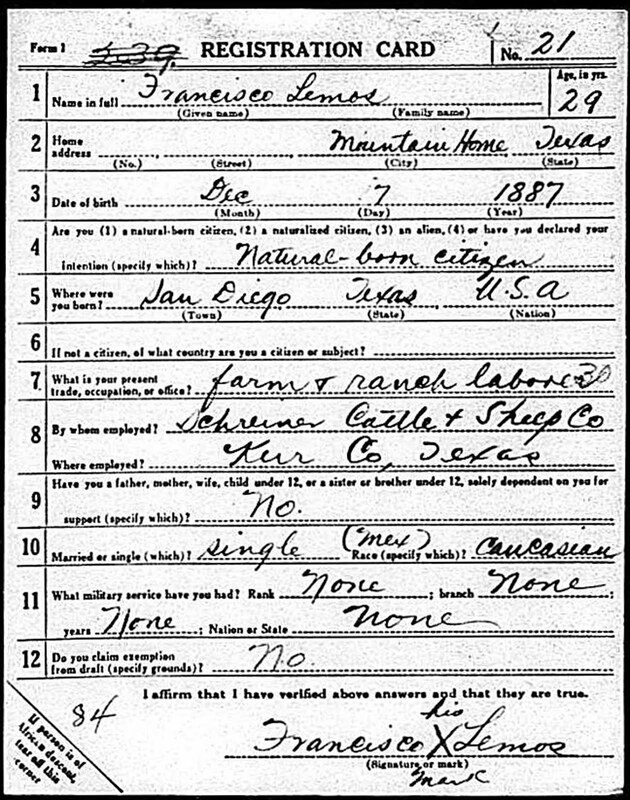 Lemos, who was born in San Diego, Texas, on December 7, 1887, volunteered for service in Kerr County, where he worked for the Schreiner Cattle and Sheep Company in Mountain Home. 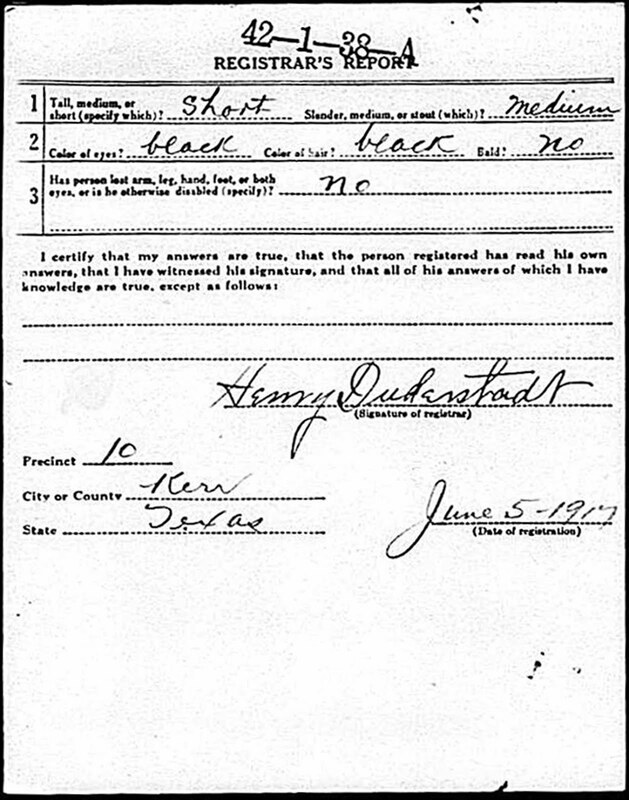 His registration card describes him as short, with a medium build, with dark brown eyes and black hair. He was a single and had no dependents. He'd never served in the military before volunteering. 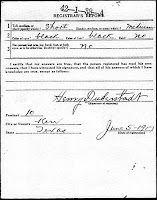 It is possible he did not know how to write his name, since his registration card is signed with "his mark," an "X." 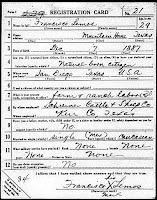 He registered for the service on June 5, 1917. I learned, from reading an old column by Father Henry Kemper, the priest of Kerrville's Notre Dame Church at that time, that Francisco Lemos had a nickname: "Pancho." 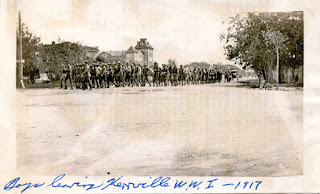 Lemos and other Texas Hill Country men left Kerrville on September 5, 1917, as part of Company D of the First Texas Infantry. They marched to the train depot, where Captain Charles J. Seeber called the roll. A soft rain fell on the assembled troops and their families as each man answered "here" and then boarded the train. I have a photograph of Company D marching to the train station, turning from Main Street onto what is now called Sidney Baker Street. Company D traveled from Kerrville to Camp Bowie, near Fort Worth, for training. I have a photograph of the company in my collection, along with a commemorative poster listing the troops and their officers. 106 names are on that roster; three of those names are also listed on the Kerr County War Memorial, a solemn structure on today's courthouse lawn; those three are among the 19 other Kerr County men who died in World War I. 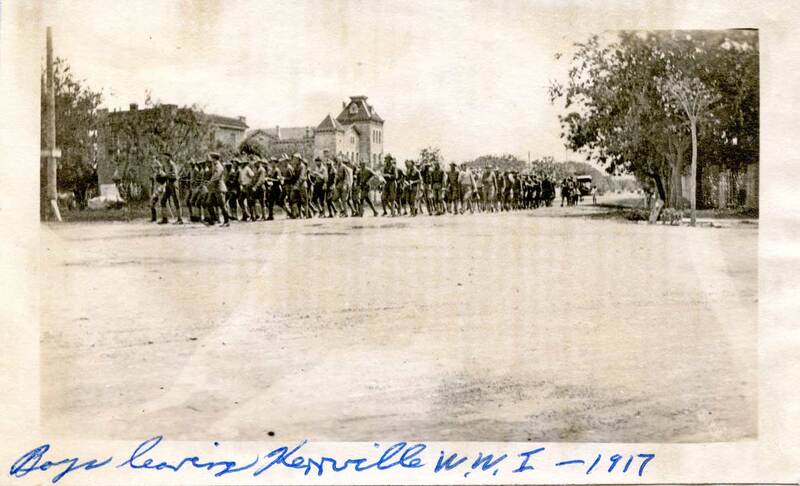 The three men of Company D listed on the Kerr County War Memorial are Francisco Lemos, Sidney Baker, and Leonard Denton -- and those three are in the group pictured marching to the Kerrville depot. Leonard Denton never left Camp Bowie; he died from influenza in April, 1918, and is buried in the Turtle Creek Cemetery. Francisco Lemos and several other Kerr County men traveled to France on the steamer Finland, leaving Hoboken, New Jersey on July 26, 1918. Sidney Baker was also on the Finland. The Battle of Saint-Mihiel was fought from September 12th through 15th, and involved the American Expeditionary Force and 110,000 French troops under the command of General John J. Pershing. Pershing's plan, in part, was to break through German lines and capture the fortified city of Metz. According to Wikipedia, it was the "first and only offensive launched solely by the United States Army in World War I, and the attack caught the Germans in the process of retreating." Like Francisco Lemos, both Sidney Baker and Earl Garrett also died in northeastern France. Sidney Baker died in the Argonne Forest on October 16, 1918; Earl Garrett, near Exermont, on October 4, 1918. Of those three, for whom streets in Kerrville were named, only Francisco Lemos is buried in Kerrville. His body rests at the Mountain View Cemetery, across Holdsworth Drive from Antler Stadium. Francisco Lemos had been in France with his regiment for only a short time, and the Battle of Saint-Mihiel was his first engagement. I've heard a story about the moments before the shell exploded, about how Lemos was singing as the scouting party proceeded along carefully, walking through a muddy field in the rain. I'd like to think the story is true, and that Lemos died singing quietly, singing a song of home. Joe Herring Jr. is a Kerrville native who visited Francisco Lemos's grave this morning as a soft rain fell. This column originally appeared in the Kerrville Daily Times September 15, 2018.